Check out Tobi's Kala Sweater Jacket Get Lost + Wander's Kala Charcoal Sweater Jacket for all your fall 'fits. 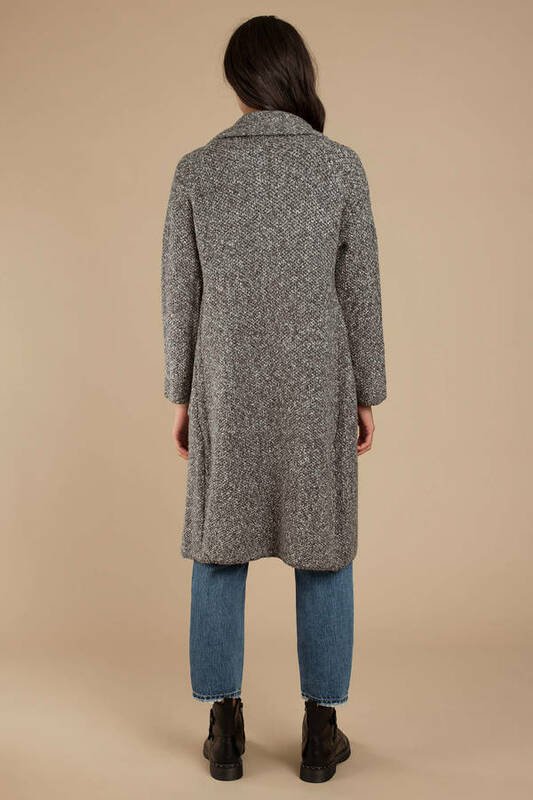 This long coat is knit similar to a cardigan but constructed like a classic overcoat that never goes out of style. Featuring a large lapel with two front pockets, this oversized coat looks best with a sweater dress and thigh high boots! Get Lost + Wander's Kala Charcoal Sweater Jacket for all your fall 'fits. This long coat is knit similar to a cardigan but constructed like a classic overcoat that never goes out of style. Featuring a large lapel with two front pockets, this oversized coat looks best with a sweater dress and thigh high boots! Charcoal modeled on a size X-Small/Small.